"Sometimes the best projects are the ones that are not about paying the rent, but loving what you are doing." 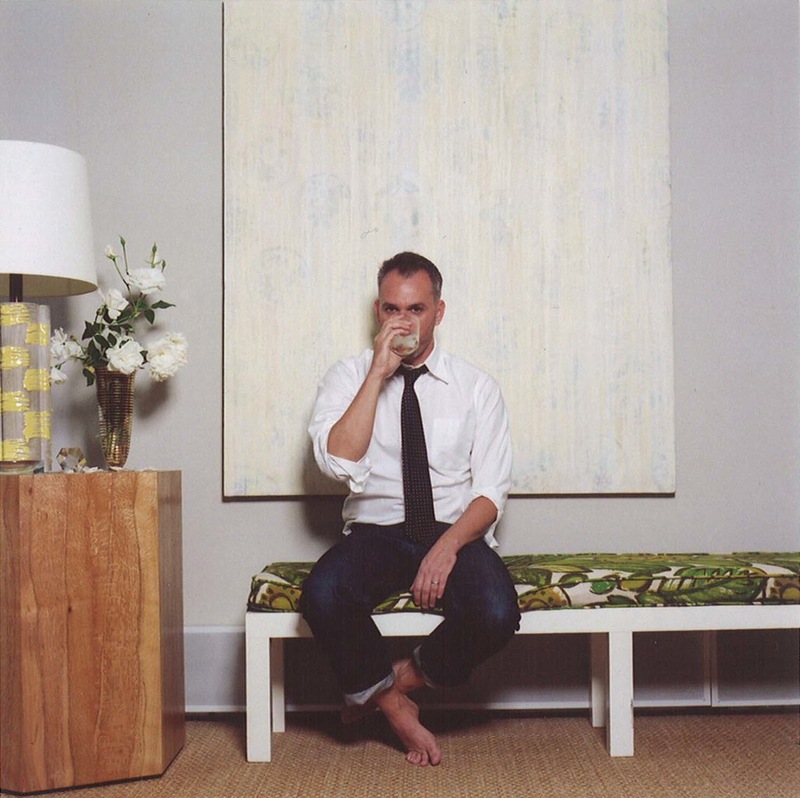 Interior designer, Charles de Lisle met the owners of Maximo Bistro, Gabriella and Lalo, in the spring of 2011 during his first trip to Mexico. The couple was working at the luxury resort, Verana in the small village of Jalapa to save money in hopes of opening their own restaurant in Mexico City. Gabi, a Mexico City native, was waiting tables, Lalo, a chef from Mexico City via Atlanta, was cooking for the guests and Charles, a San Francisco designer, was having lunch. The incredible food initiated their first conversation. "Lalo was cooking lunch halfway up the cliffs in a shed with nothing other than a single propane burner, a bucket, and a bottle of water. The fish came directly off the boat and the produce was sourced from local vendors he and Gabi had found during the summer. By the second day, I was sitting having lunch and could not believe the amazing quality of the food. I asked Gabi where the amazing meal came from. She introduced me to Lalo, after which we all would talk about food, design and foraging." The trio became fast friends and quickly realized they all had a mutual affection for traditional Mexican food. On Gabi and Lalo's day off, they secured a rental car and drove up into the mountains in search of local eats. This was especially thrilling to Charles since it aligned perfectly with his current aesthetic attraction. "When we met I was enamored with the traditional Hacienda design style; Mexican and Colonial, both traditional and simultaneously fresh feeling. Gabi and Lalo were dreaming of creating a local neighborhood bistro that would serve high caliber, affordable Mexican fresh ingredients in a setting that was familiar and inviting. Six months later they called me and asked if I would consider helping out with design on their project. I said, "yes." With barely enough funding to open the restaurant, Charles was so thrilled about the project with his new friends, he graciously traded his services for tours of the local taquerias. "I decided to trade my design services for tours of Mexico City taquerias. Gabi and Lalo offered to pay for my flights. That was our contract. Then we all just got excited about how the hell we would get it done with what we had." 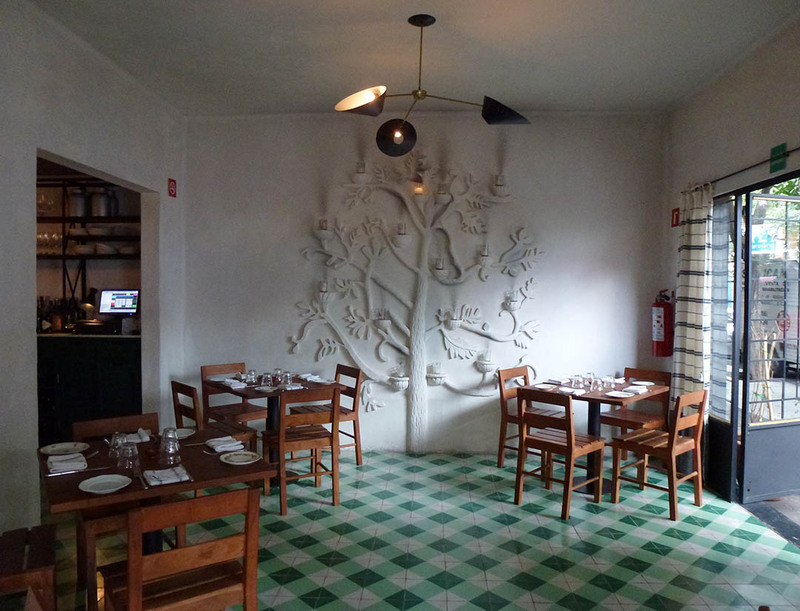 With a challenging budget driving interior aesthetic decisions, Charles was able to transform the selected restaurant space of a wheelchair rental shop into an inspired Mexican local bistro with distinct handmade touches. 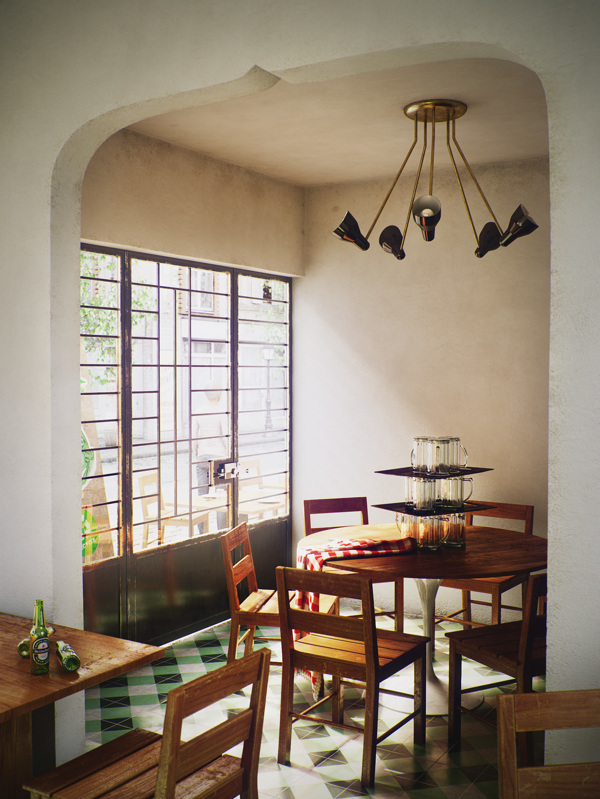 "I had been collecting books on Haciendas and my friend Patricio took me to the Luis Barragan House, which had a huge impact [on design]. I went back with Gabi and we discussed how this idea of simple beauty in light and texture would feel good in our new space. We committed to making as much as we could and tried to have everything translate as the hand of the person who made it. We found a farmer who made all of the chairs and tables from a huge Mesquite tree. We built sturdy, humble benches in the style of Barragan, making one prototype after another until we got the sit right. The windows were inspired by The Roma, which has great 1940's storefronts, and painted conservative black. The traditional concrete tiles are a combination of custom colored concrete and black Mexican Lava. The napkins and drapes were all hand-woven on small looms in Oaxaca. 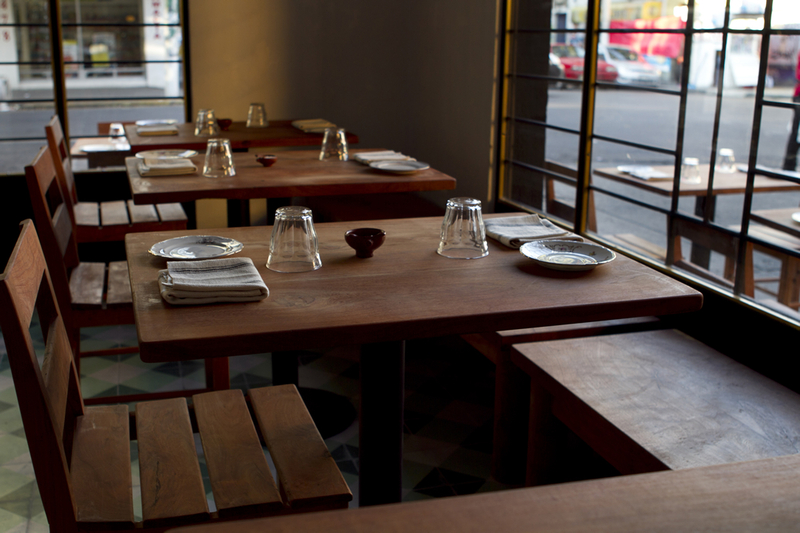 All the dishes were made at a local 3rd generation shop in Mexico City. The 1960's lightolier fixtures were sourced from a local vintage dealer. 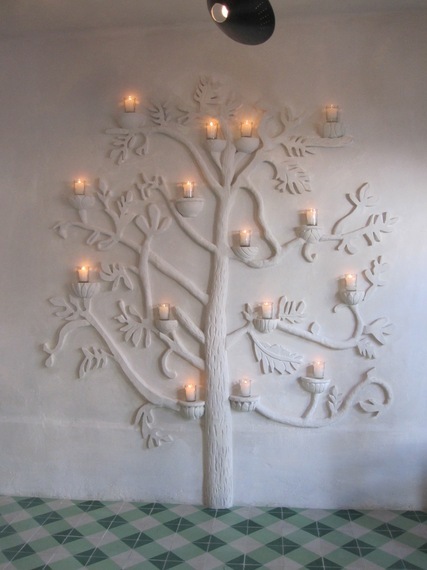 And lastly, we found a young artist whose grandfather repaired all the church reliefs, and had him help make the "tree of life" that's lit with market candles at the main wall in the restaurant. The tree is my favorite part. It's elegant and rustic, and resonates so beautifully in the room." It took three weeks for locals to start talking about Maximo Bistro. The glow of the candle-lit room attracted neighbors and word quickly spread about the quality of the food. Today, Maximo Bistro can proudly say it's a destination restaurant where all tiers of social status can be found dining together. "Neighborhood locals, artists, 20-year-olds, families and diplomats. Rick Bayless is a fan. Alice Waters just dined last month. Mexican celebrities are regulars and regular people are regulars. There are some locals that go 3 or 4 nights a week. It's busy. So much so, that this winter, we commandeered the apartment upstairs and turned it into a secret living room bar for guests waiting, or after dinner. I have had the good fortune to meet many. Everybody seems to equally be in love." In speaking with the designer, it's clear his enthusiasm for this labor of love still holds strong and following your heart brings great happiness. "Sometimes the best projects are the ones that are not about paying the rent but loving what you are doing. Somehow, we all had the intuition that if we followed the path we were excited about it would work out. The three of us are convinced that our excitement for what we built shines through in the end." 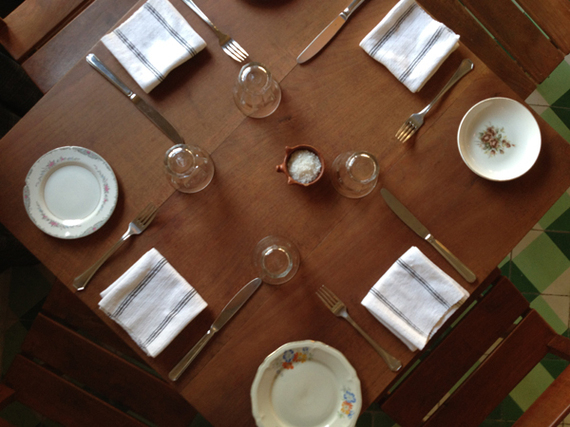 This September, the next Charles/Gabi/Lalo restaurant collaboration, LALO! opens across the street from Maximo Bistro.